Everything within it is designed to be life sized. The Basilica is filled with biblical statues and Latin phrases surround its perimeter. At first glance it seems pretty par for the course in terms of churches. However, then you realized that each statue is built to scale so that to a viewer standing in the church everything appears life-sized. This is especially impressive given that there are statues ranging from 10 to 70 meters above ground level. It means that the statues higher up are in some cases twice as large as those closer to the ground even though to a viewer they just look “normal.” See the Latin phrases which towers over visitors at two different heights? That top row is also almost twice as big. There are corpses on display. The Catholics believe that in certain instances divine intervention allows bodies to be preserved from the natural process of decomposition. When this happens, it it believed to be a sign from above of that individual's holiness. Formerly this used to count as a miracle and some saints were canonized due to their incorrupt bodies being discovered after death. While it is no longer believed to be a second miracle, it is still a holy sign nevertheless. 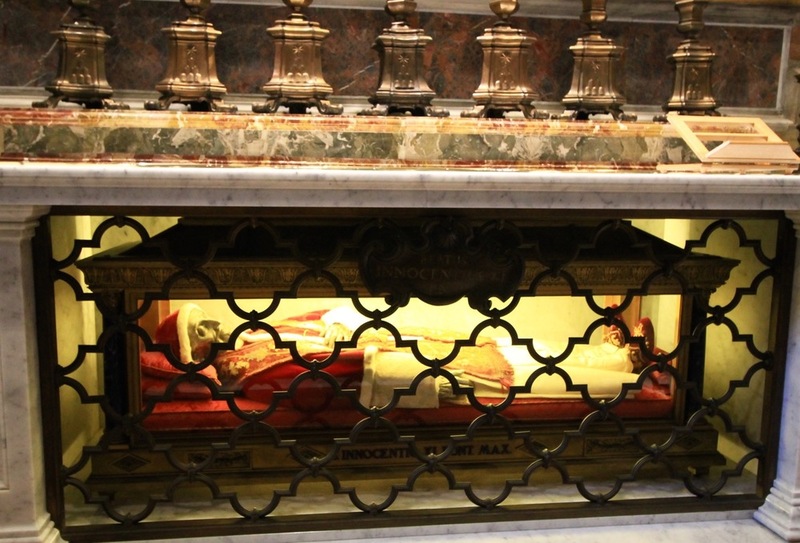 Within St. Peter's Basilica you can see a few incorrupt bodies, most famously Pope Saint Pius X. His casket was opened 30 years after his death and his body was declared incorrupt. His corpse is now on display for all to see on the main floor of the Basilica. The paintings are not paint. Look closely at the paintings throughout St. Peter's Basilica and you'll notice that almost every “painting” is in fact a mosaic. 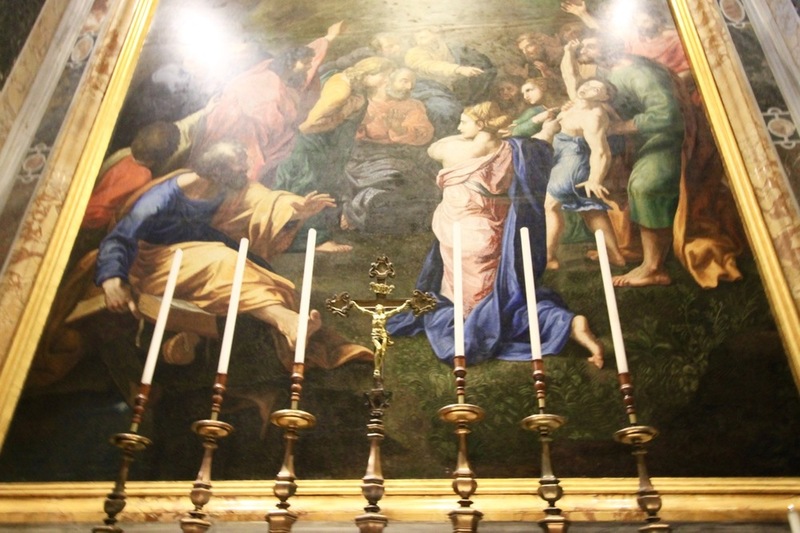 Though many paintings used to hang within the Basilica's walls, most have been moved to the Vatican Museum for preservation reasons. 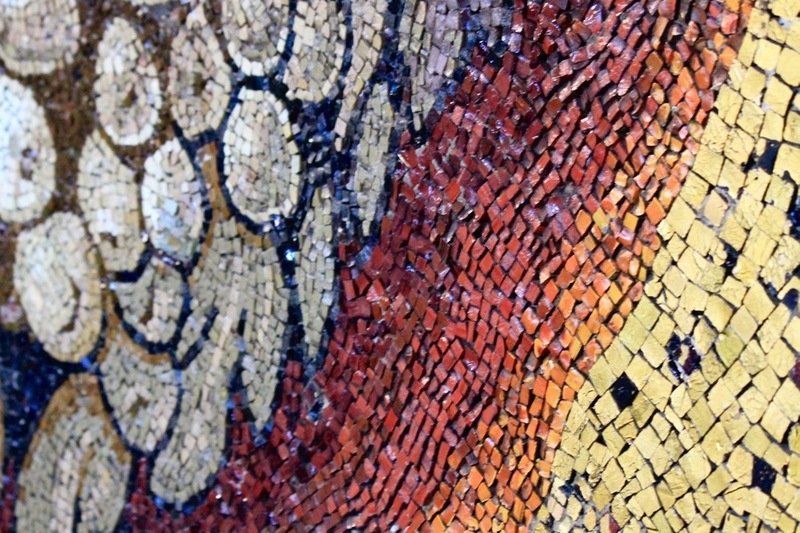 The paintings, however, have been replicated by intricate mosaic designs made to look the same. Think of the painstaking hours spent putting each individual tile into place. Then think about the difficulty in creating the life-like shadows and depth of each image while standing right up against it. It's been “under construction” for almost 1,700 years. St. Peter's Basilica was originally commissioned by Constantine I around 320 A.D. and the original construction took about 50 years to complete. However, the Basilica was not kept up throughout the centuries and needed to essentially be rebuilt throughout the 14, 15, and 16 hundreds. It was also created with the intention of being a living structure. The idea was that as the church continued throughout time, more saints, relics, and tombs would be added. At the moment, it is the resting place of 91 popes. Michelangelo's La Pietà was once destroyed. A highlight for many visitors is seeing Michelangelo's Pietà up close and it's not surprising why. When standing just feet away from the masterpiece you can see the unbelievable amount of detail put into the figures of Mary and Jesus. It's as if both are actually alive. You can almost see the blood that used to pulse through Jesus' veins and if you look closely, you can see the tears collecting in Mary's eyes. Now the little known fact: Unfortunately, La Pietà, which used to be out in the open, is now concealed behind bullet proof glass. In 1972 a geologist, claiming to be Jesus Christ, attacked La Pietà with a hammer. He destroyed Mary's arm and damaged her face. Many pieces of the statue were collected by bystanders, and only some were returned, so the restoration included taking pieces out of the back of the statue to fix the front. It's sad that the masterpiece has been damaged, but frankly, even knowing it happened, I challenge you to be able to tell. 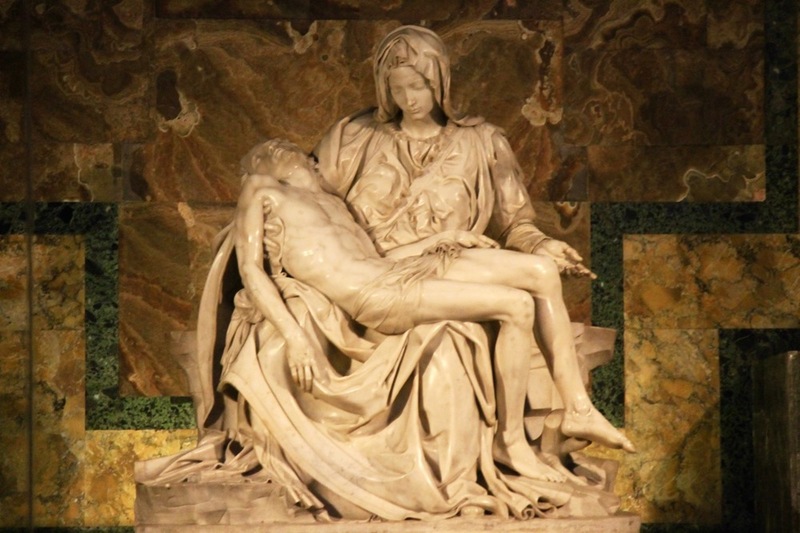 As another fun fact, La Pietà is the only piece of art that Michelangelo ever signed. So, there you have it, five little known facts about St. Peter's Basilica. I have to say, I was completely astounded by the Basilica, its dome, and the rest of Vatican City. I thought I could complete a tour of Vatican City in a partial day, but instead found myself running around to squeeze it all in within a full day. If you want to know how I did it, check out this one day guide to Vatican City.